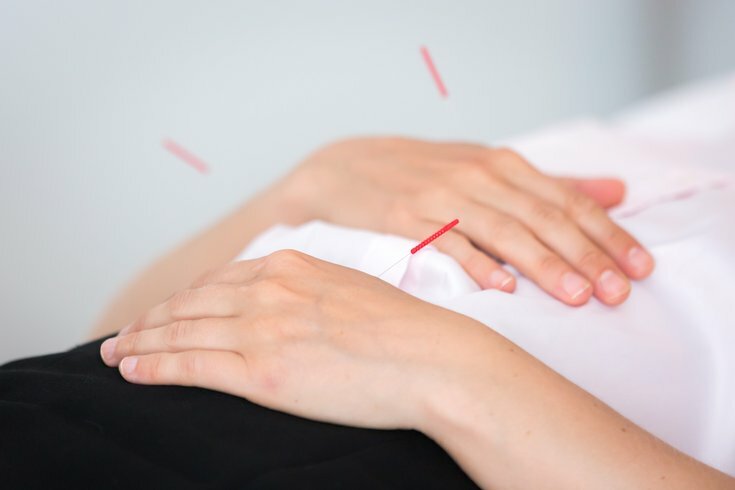 Needles in the hands and forearms of Stephanie Rodigas, who was receiving treatment at Windrose Acupuncture in Center City Philadelphia. Julie Moore spent more than two decades managing IT teams in the corporate world – a stressful job that often left her battling migraines. Eventually, Moore turned to acupuncture, a traditional Chinese medicine that has risen in popularity in the United States. "What I found was that acupuncture reduced the intensity and the frequency of those migraines," Moore said. "But also, I felt more balanced. I felt less edgy when I would get acupuncture. The effect was so profound that I decided to make a career change out of it." Now a certified acupuncturist, Moore launched Windrose Acupuncture last November. And she did so with her former self in mind. 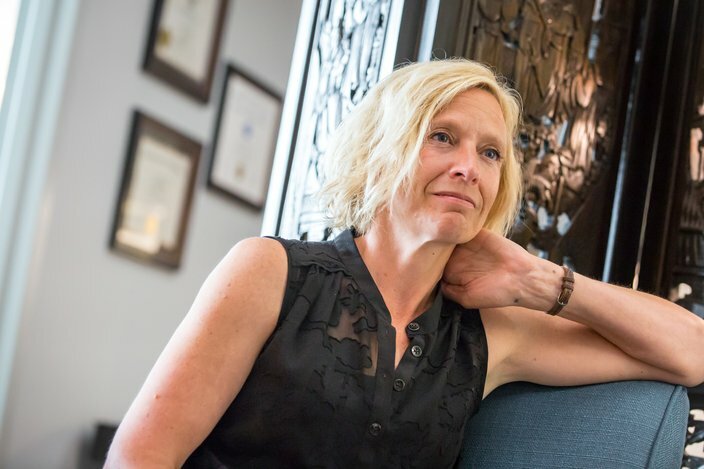 Not only did she open her private practice in Philadelphia's business district, Moore also offers "on-the-go" acupuncture sessions designed for working professionals looking to squeeze treatment into their busy schedules. "I still wanted to offer that private, individual touch," Moore said. "But I know, in my corporate experience, the windows of opportunity are not great. To be able to get in here, get a good treatment and get you back to your desk within an hour, is basically my goal." Those sessions, which last 45 minutes, usually just include acupuncture, though Moore practices other modalities. And they are geared for returning patients who have completed at least one of her "complete care" sessions. By contrast, "complete care" sessions run about 75 minutes and often include additional modalities, such as cupping, Gua sha or Tui na. They also provide Moore an opportunity to inquire about a person's well-being – from head to toe. "Acupuncture is a holistic medicine," Moore said. "So you may have pain in your foot. I want to know what's going on up here (in your head), too. I want to know your whole experience, because I'm not just treating the pain in the foot." Julie Moore founded of Windrose Acupuncture with her former self in mind. She wanted to offer treatments to busy working professionals with limited availability. Moore's idea for "on-the-go" sessions is not without precedent. Lunchtime bookings at spas have become more popular in recent years, as working professionals slip quick massages and beauty treatments into their mid-day breaks. Similarly, the advent of telemedicine could prove to be a gamechanger for efficient medical needs. Phila Massages, a sports massage practice with locations in Rittenhouse and Manayunk, offers massages that range from 30 minutes to two hours. Lunchtime bookings have always proved popular thanks to the practice being located in areas surrounded by businesses, according to branch manager Martin Nat. "We see many athletes who juggle busy work days with various training schedules and it's our goal to help and educate them on the importance of recovery," Nat said. "Sometimes, an hour at lunch is all they have time for, and for others it's because they might have a certain issue that needs to be addressed before a big workout later in the day." Additionally, telemedicine has added another tool for people needing quick input from a doctor. Doctors at Thomas Jefferson University Health Services regularly treat patients for acute issues, such as colds, rashes and sprains, through JeffConnect, the organization's telemedicine service. Other local healthcare providers offer similar services. Less than five percent of Jefferson's telemedicine requests lead to in-person visits, according to JeffConnect Medical Director Dr. Aditi Joshi. And patients can speak to doctors around the clock via the JeffConnect app. "We can get quite a lot of information, even doing a visit over video," Joshi said. "Afterwards, we'll talk about the different things to consider. We'll even write a prescription and talk about what we recommend, just like any other visit." Stephanie Rodigas, a patient of Windrose Acupuncture, has been receiving acupuncture treatment for many years. It particularly helps her when the seasons change. When Moore was working in the corporate world, she typically received her acupuncture treatments on weekends. "My acupuncturist was never nearby where I worked," Moore said. "My experience was that I was in meetings all of the time. If I had that one-hour slot, that was the time that I was going to go on an errand and then immediately back for the next meeting." Though Moore offers "on-the-go" treatments, she said her "complete care" sessions remain her most popular service. Patients use them to treat an array of ailments, including back pain, infertility and stress. Acupuncture stimulates specific points on the body, typically through the insertion of tiny needles – about the size of a cat whisker. Studies have shown acupuncture to be an effective treatment for a variety of ailments, though people respond differently. Its popularity has risen over the years, with more than 3 million Americans receive acupuncture treatments every year, according to the National Institutes of Health. In Philadelphia, various health networks have added acupuncture programs, including Penn Medicine, Temple University Health System, Jefferson Health and Children's Hospital of Philadelphia. "I see a lot of pain," Moore said. "I think in our western culture, that's when people most often hear about acupuncture. They'll have pain and someone will say, 'Oh, hey, this worked.'" That's how it worked for Moore – both when she developed sciatic pain while training for a bicycle race and again when she began experiencing migraines. And for Stephanie Rodigas, who first came to acupuncture 13 years ago while living in California, and now sees Moore several times a year as part of her self-care tool kit. "I really try to stay on top of getting four to six sessions right at the turn of the spring season or fall season," said Rodigas, 37, of Point Breeze. "I find that that helps manage that transition, from the heat to the cold, and then from the cold to the heat." 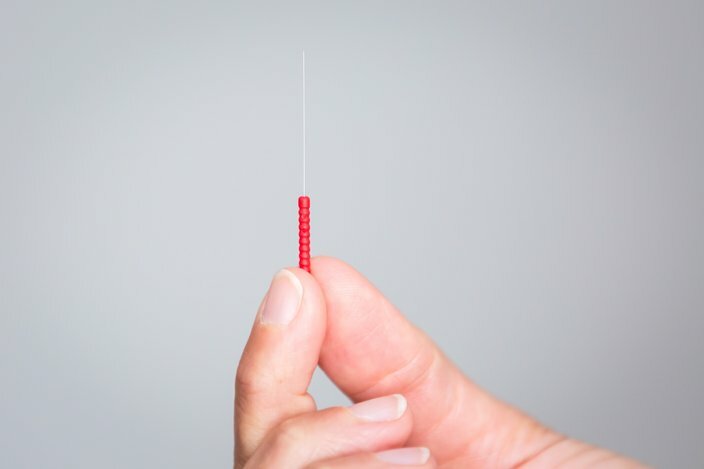 A .16mm acupuncture needle is many times smaller than an average hypodermic needle. Rodigas primarily sticks to Moore's "complete care" offerings, partly because she has the time to schedule them. But Sam Tropio – another Moore patient – said he recently tried an "on-the-go" treatments with considerable success. The 45-minute session gave Tropio "great results" for his back pain, he said. Tropio, 36, of Graduate Hospital, has been receiving regular acupuncture treatments since waking up with "buy-a-new-mattress" back pain three months ago. Tropio, who practices Brazilian jiu jitsu, said he typically is hesitant to seek any kind of medical intervention, much less alternative medicine. But he said his back pain was so bad that he tried cryotherapy, "lots of heat and ice packets" and, eventually, acupuncture. Acupuncture has given him the most relief, and he intends to keep it in his regimen. "I do Brazilian jiu jitsu three days a week," Tropio said. "I lift weights twice a week. While I'm doing that, I think it's going to be important for me to take care of my body. And this is going to be one of the ways I'm going to do it." But Tropio, the father of a two-year-old who cherishes time at home with his family, foresees using the "on-the-go" treatments more in the future. "My time is definitely limited," Tropio said. "And I had great results from the 45-minute session." That, after all, is the reason Moore offers such sessions. "I knew that I wanted to come back and help that population," Moore said. "That's why I'm so thrilled that I landed here – easy access to the business district."